With the ExoTourbillon Rattrapante from the Collection Villeret 1858, Montblanc presents a unique timepiece in the world of haute horlogerie. This wristwatch combines a split-second chronograph and Montblanc’s patented ExoTourbillon, which has a large balance that oscillates outside the tourbillon’s rotating cage. The three-dimensional regulator dial is made of gold, decorated with grand feu enamel elements crafted in accord with the tradition of ultrafine watchmaking, and includes a display for a second time zone with a day/night indicator. The Montblanc Manufacture in Villeret has acquired comprehensive expertise in the discipline of grandes complications. The manufactory’s history began in 1858, when it was established under the name “Minerva”. The manufactory is one of the few which doesn’t only fabricate components: ever since its earliest days, complete and meticulously handcrafted movements have been developed and built here. Their ongoing development and the broad know-how in the discipline of measuring brief intervals led to the production of split-second stopwatches in the mid 1930s. So-called rattrapante chronographs can measure intermediate times without interrupting the ongoing measurement of a longer elapsing interval. These stopwatches from the manufacture in Villeret were used successfully at the Winter Olympics in 1936. Today too, the Montblanc Manufacture unites traditional Swiss horological craftsmanship of the highest level and an indefatigable striving for innovation. Split-second or rattrapante chronographs rank among the grandes complications. 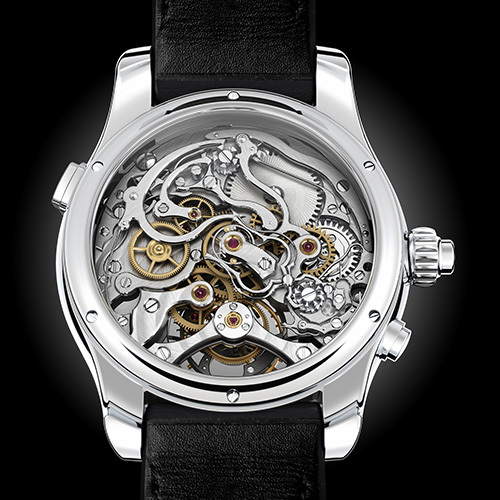 Extraordinary mechanical complexity and nearly 70 % more components than a conventional chronograph mechanism enable them to perform the useful function of momentarily halting the split-second hand to indicate an intermediate interval without interrupting the measurement of a longer elapsing interval by the chronograph’s elapsed-seconds hand per se. Watchmakers devote extreme care to the delicate steel components, which are extraordinarily difficult to fabricate, finish and assemble. 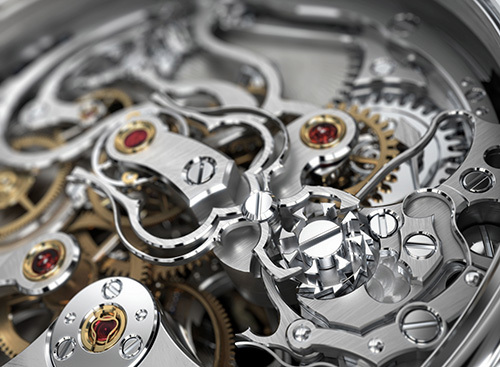 These tasks – along with the mise en fonction, when the functional components of the chronograph and the split-second mechanism are finely adjusted and, if necessary, delicately abraded to interact with the utmost smoothness – are performed with traditional handcraftsmanship at Montblanc in Villeret. Needless to say, many years of experience are an indispensable prerequisite. For reasons related to the construction of every mechanical watch, the centre of gravity of the balance and hairspring is not directly collinear with the balance’s staff. This eccentricity is disadvantageous when the timepiece is in a vertical position because Earth’s gravitation attraction acts on the eccentric centre of gravity and accordingly disturbs the regularity of the balance’s oscillations. In a conventional tourbillon mechanism, the balance is borne inside a cage that constantly rotates around its axis, while the balance’s eccentric centre of gravity likewise orbits this axis in the same interval. The acceleration that Earth’s gravity causes during the first 180° of the tourbillon’s rotation is compensated by a corresponding deceleration during the second half so the movement keeps time at a regular rate for each rotation. 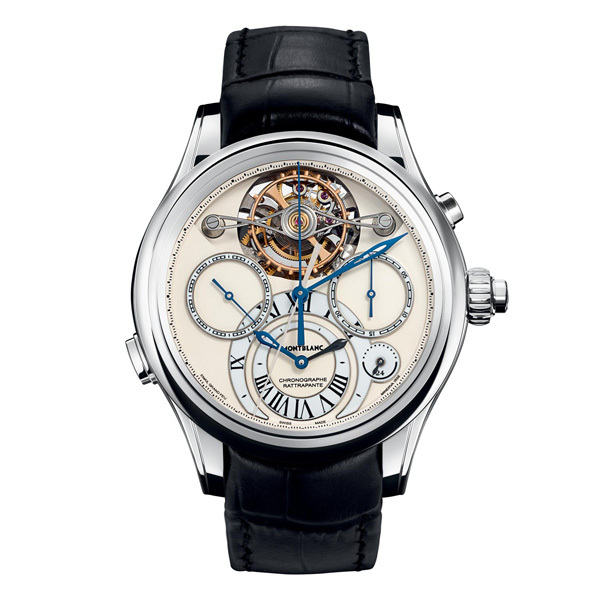 The Montblanc Manufacture in Villeret specializes in tourbillon escapements. The watches of the Montblanc Collection Villeret 1858 are equipped with large, massy balances that require big rotating cages. As their rotation requires a correspondingly large amount of energy to keep them in motion, the tourbillon mechanism for these timepieces can be mastered only by watchmakers endowed with the most profound expertise and the greatest manual dexterity. 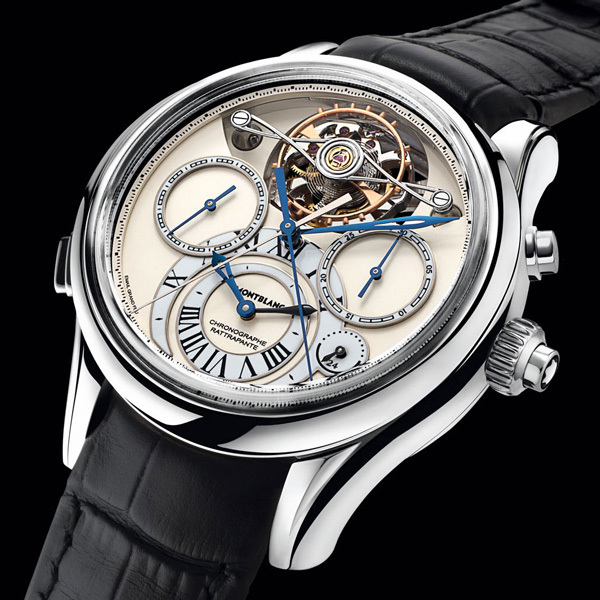 Their skills are nowhere more impressively evident than in the watches that comprise the energy to power other functions of the movement so that these impressive screw balances, which are traditionally handcrafted in the manufacture, can be included in tourbillon watches with additional complications. The striving for perfection at the Montblanc Manufacture in Villeret resulted in the development of an innovative tourbillon construction that brings significant advantages in terms of energy request and precision: The patented ExoTourbillon. Its balance is isolated from the tourbillon`s rotating cage so the cage’s rotation doesn’t interfere with the balance’s oscillations. It is the world’s first tourbillon with a rotating cage that is smaller than its balance, which oscillates outside the cage – whence the Greek prefix “exo” (outside) in the timepiece’s name. The balance in this unconventional configuration is borne between two jewels, while the tourbillon pivots in a two-point bearing, i.e. it is neither cantilevered nor borne between an ordinary pair of bridges. An advantage of isolating the balance from the rotating cage is that the balance performs with greater precision because it isn’t disturbed by the inertia of the cage. The smaller rotating cage has less mass and is freed from the weight of the balance, so less energy is needed to power its rotary motion. Another exclusive feature of the ExoTourbillon is the slower speed of its rotations, each of which requires four minutes. 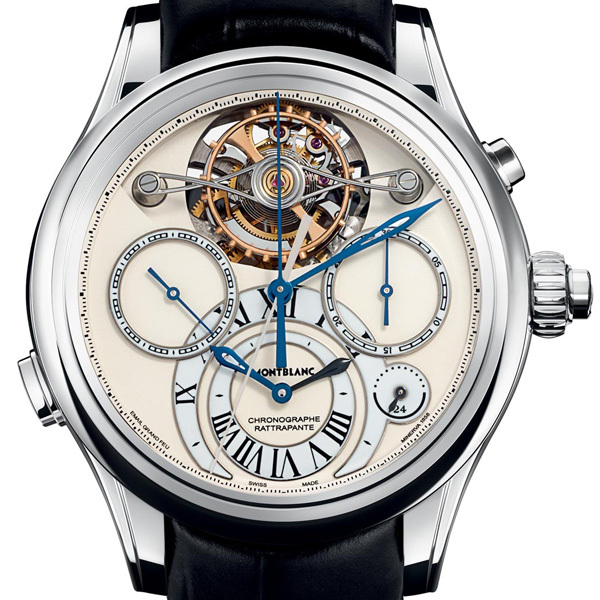 Conventional tourbillons typically complete one rotation per minute. The slower rotational speed requires less energy from the barrel, but produces the same compensating effect as speedier tourbillons. Thanks to the ExoTourbillon’s patented energy-saving construction, a tourbillon can be wed to a cleverly designed split-second chronograph function. Despite its mechanical complexity, this split-second function can work with the same barrel and the same power reserve as those of the basic chronograph movement – and can do so with greater precision than would be possible in a chronograph without the ExoTourbillon’s construction. The ExoTourbillon Rattrapante indicates the time of day or night as do regulator clocks. With the main stage for the minute-hand, a subdial for the continuous second at 9 o`clock and the hour-hand that slowly circles its subdial at “6 o’clock”, this timepiece features the same arrangement as it was used on the faces of the long-case regulator clocks that kept time more than two centuries ago in the ateliers of famous watch manufactories. The regulator display on the dial of the ExoTourbillon split-second chronograph is augmented by an indicator for the time in a second zone. Two hour-hands leisurely sweep around the smaller dial at “6 o’clock”: a skeletonised hand for the hour in the current local time zone and a blued hand for the hour in the wearer’s home time zone. A 24-hour indicator augments the ensemble. The ExoTourbillon is positioned outside the movement plate per se, so a partially openwork dial and a pane of sapphire crystal in the back of the case offer deep and rewarding insights. The dial, which has an elaborate three-dimensional structure, is a multipart construction made of solid gold. Its principal surface is plated with rhodium and adorned with grainé décor; the area around the tourbillon is slightly recessed. The dial is wreathed by a flange (réhaut) that’s calibrated with a readily legible fifth-of-asecond scale for the chronograph and that simultaneously shows the continually running minutes. All other scales are crafted from solid gold with grand feu enamel appliqués. The applied scale for the continually running second-hand is at the “9”, the chronograph’s counter for thirty elapsed minutes is at the “3”, and the bipartite enamel appliqué at the “6” hosts the hours display for two time zones and a 24-hour indicator for the home time. Ranking among the oldest and most sophisticated techniques for decorating precious timepieces, grand feu enamel is also a long-lasting embellishment, preserving its colour and gleam for centuries. Only a handful of Manufactures around the world possess the capacities and know-how to manually fabricate the balance springs of mechanical timepieces by hand. The Montblanc Manufacture in Villeret is among this select group. The master watchmakers themselves make the balance springs in their entirety, measuring their length, not by electronic means, but, in accordance with tradition, by hand and to the utmost accuracy. This striving for perfection also finds expression in the sophisticated finishing operations with which the watchmakers of the Manufacture in Villeret enhance the appearance of each individual component of the movement. Edges are chamfered by hand, plates are artistically ornamented with Geneva stripes and wheels are given a high polish. The watchmakers use traditional materials such as Grand-Feu enamel for the dials, where they rely on techniques that impressively reveal their craftsmanly expertise. Laborious handcraftsmanship, invested in each ExoTourbillon Rattrapante from the Montblanc Collection Villeret 1858 and performed in accord with authentic Swiss watchmaking tradition, explains the limited number of watches in the series of these grandes complications timepieces. This model is therefore available only in a strictly limited edition of eighteen watches, each with an 18 karat white gold case. The circular gold case measures 47 mm in diameter, is polished to a high-gloss finish, and is harmoniously augmented by a highly domed sapphire crystal with vertically descending flanks. The screwed back includes a sapphire crystal viewing window through which connoisseurs can admire the elaborate chronograph mechanism with its additional split-second function. The chronograph’s column-wheel is visible at “6 o’clock”; the split-second column-wheel can be seen near the split-second button; and between the two, an aficionado will find the artistically shaped coupling-, braking- and heart-levers as well as the split-second clamps with their springs. The edges of these components are bevelled, their surfaces are brushed, and their flanks bear fine, elongated embellishments. The perfection of these elaborate decorations is assured only when they’re crafted by hand. Their bright gleam contrasts beautifully with Geneva waves on the bridges, glossy red jewels, and gold-plated wheels. The hairspring has an upward Phillips curvature at its outer end and oscillates at the traditional pace of 18,000 semi-oscillations per hour (2.5 hertz), thus enabling this chronograph to measure elapsed intervals to the nearest fifth of a second. The watch is affixed to a black alligator-leather wristband secured by a pronged buckle made of 18 karat white gold.